I travel for a lot of reasons, but chilling isn’t one of them. I had an inkling this was the case, but my suspicions were confirmed during a trip to idyllic Rancho Pescadero in Baja California Sur. Upon arrival at our rustic-in-all-the-right-ways-for-a-gringo boutique hotel, while other guests worked on either siestas or cervezas, I spent a few hours asking the hotel staffers what they did for kicks. As it turns out, not much. Answers narrowly ranged from “go to the beach,” to “have a margarita.” Even when I prodded for more ambitious suggestions, the most common response was a quizzical look and a disapproving head shake. Didn't I trek to this part of Mexico — surrounded by nothing but sand, surf, cacti, and half-built vacation homes — to relax? Yeah, I guess. So I tried to blend in with the crowd: suited up, grabbed my hat, slathered on sunblock — judging from the various stages of golden brown to brick-red vacationers on the premises, I may have been alone in this step — plopped down poolside, and ordered lunch (which, technically, is an activity). I was occupied for roughly 48 minutes, or the time it took to consume one tequila on the rocks with fresh lime, two soft tacos, and a serious amount of chips and salsa. I sat under my sunbrella, contemplating another round of guac (a double on day one? too much? ), when it struck me that something was not right. It was all just too easy. Was I really so stressed out after nine hours of sleep in my well-appointed oceanview room that I needed to recooperate by the pool all afternoon? Suddenly, the power went out (something about propane) and I was told it wouldn't be back on for a few days (something about a national holiday). As if sensing my restlessness, Alfredo from the front desk informed me about a good internet connection down the road at Baja Beans. An internet cafe in the middle of the desert? Now I could get into that. (At this point, he could have piqued my interest with a mere mention of the neighborhood laundromat). I grabbed my laptop and jumped on a beach cruiser. I headed past the hotel's organic vegetable garden, took a right at the gate, scooted past half-built adobe homes, sandlots, and basil fields, and cruised straight down the dusty dirt road — frequented only by a few surfers and the occasional buzzard. 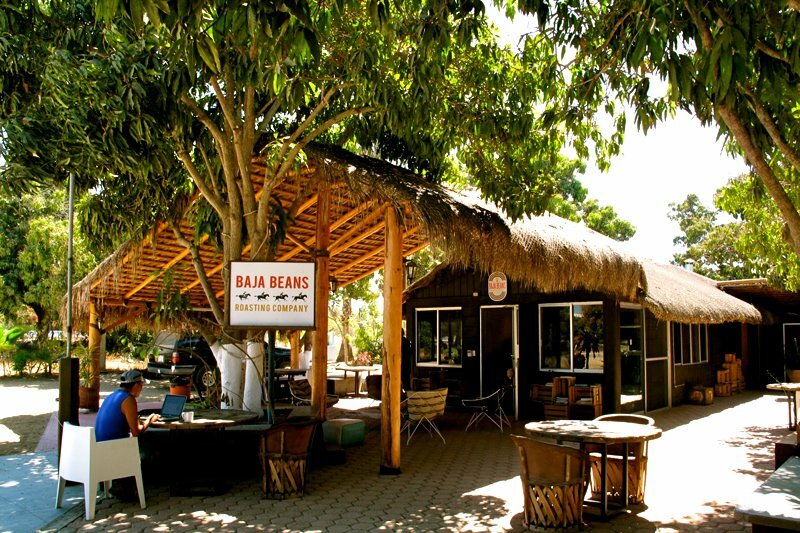 Eventually, out of the sea of succulents and palms, I spotted the orange and black sign for Baja Beans. Graphic orange, red, and black signage with a strong Mid-Century feel and a smart font. This was not the two-bit cyber shack I was expecting. The sign on the door said “closed,” but the unlocked gate and good music said “open” to me. I had barely rolled my bike up the stairs when owner Alec Tidey welcomed me with a friendly wave hello from across the open-air patio. Since opening the cafe with his wife April (an interior and landscape designer responsible for the groovy, modern bohemian aesthetic), the part-time El Pescadero residents by-way-of Vancouver had gotten to know all the locals. It was either the computer bag or SPF 50 written all over my face, but he could tell I was new in town. He told me that the hours on the gate were more of a suggestion than a policy, and that I should totally hang. I took quick stock of the pastry case (it was almost empty at the end of the day, but the softball-size berry scones and gooey cream cheese-frosted carrot cake would surely do) and sized up the beverage menu: espresso drinks, a variety of teas, and by-the-cup coffees (made in homage to the old-timey cowboys who poured hot water over coffee grounds in a sock). Once I had my iced latte in hand — brewed using sustainable and regionally harvested beans roasted in a shiny brass Probat in the very next room — I headed to the patio and settled into a molded white chair at a table underneath the mango trees. Café policy states that if a fruit falls on your head, your next coffee is free. I snacked away to the tunes of Edward Sharpe & The Magnetic Zeros, exchanged pleasantries with other happily caffeinated customers, and caught up on e-mails that had fallen by the wayside — a ritual I repeated everyday for the rest of my vacation. Then I packed up my things, rode back to the hotel, plopped my stuff down poolside, and claimed the chaise I had rightfully earned. Flight: Fly to Los Cabos International airport (SJD). Direct flights are available from most major U.S. airports. It's two hours from Los Angeles, six hours from New York City. Drive: Rancho Pescadero is 1½-hour drive north, and car service is available. Crystal, a writer and editor based in LA, is often surprised by her sedentary career choice considering it's impossible for her to sit still. You can follow her at @crystalmeers on Twitter, Instagram, and Pinterest. She travels for the action.